What Is DA Form 7246? DA Form 7246, Exceptional Family Member Program Screening Questionnaire is a form filed by service members when enrolling a family member into the Exceptional Family Member Program - or EFMP. This form serves as a summary of the health condition and needs of that family member and later plays a role when selecting assignments for the service member. The EFMP is a program that works throughout all branches of the Military together with civilian agencies to provide a comprehensive and coordinated approach to medical, educational, housing, and personnel services for families with special needs. The Army EFMP includes both personal support and family support functions. The latest version of the form - often incorrectly referred to as the DD Form 7246 - was released by the Department of the Army (DA) in June 2009. An up-to-date DA Form 7246 fillable version is available for digital filing and download below or can be found through the Army Publishing Directorate website. DA 7246 related forms include the DA Form 5888 (Family Member Deployment Screening Sheet), the DA Form 5888-1 (Screening of Family Member in Remote OCONUS Areas), the DD Form 2792 (Family Member Medical Summary) and the DD Form 2792-1 (Special Education/Early Intervention Summary). How To File Da Form 7246? Dependents Schools Outside the United States), 28 August 1986, 10 USC 3013; 20 USC 921-932 and 1401 et seq. To obtain information needed to evaluate and document the special education and medical needs of family members. medical needs of family members for consideration in personnel assignments. successful processing of an application for family travel/command sponsorship. you have provided us to screen? If yes, please list conditions/services received and address of provider. hospitalization for normal uncomplicated childbirth? If yes, please explain. educational services from any providers other than a general practitioner or family practice physician? 8. Do any of your children now have, or have they ever had, any of the following? Education Plan (IEP))? If yes, who? refusal to provide information may preclude successful processing of an application for family travel or command sponsorship. (UCMJ).) These actions will include, at a minimum, a general officer letter of reprimand. about changes in medical or educational status for all members of my family, after the date indicated below, and prior to PCS move. The first box at the top-right corner of the form requires the name of the medical treatment facility. The next section is for the service member's personal data. The required information requires their name, home address, home phone, rank, branch, unit, duty address, and duty phone along with the date of filing and the projected post, camp or station of assignment. The service member has to list the family members that they would like to enroll in the EFMP. The lists require the names, sexes, and dates of birth of those family members. The service member has to specify if any of them is already enrolled in the EFMP. Block 1 is for providing information on any family members with additional medical records other than the ones already provided. If yes, it is necessary to specify the family member, their condition and required services along with the name or address of the healthcare provider in the corresponding columns. Block 2 is for specifying if any of the listed family members have been hospitalized in the past five years. If yes, the name of that family member and the reason for hospitalization are provided in the corresponding columns of the table. The service member has to specify if any of the listed family members are currently receiving any medical or educational assistance from anyone other than a general practitioner or family practice physician. Block 4 is completed if any of the listed family members are currently taking prescription drugs other than birth control pills. If the answer is yes, the name of the family member and the prescribed drug must be specified in the corresponding boxes. Block 5 is completed if any of the listed family members have been treated for or had any problems connected with health issues from the list provided on the form in the last five years. Any prior treatment connected with mental health issues from the list provided on the form must be specified in Block 6. Block 7 is for specifying if any family members have ever stayed in inpatient psychiatric facilities, residential treatment centers, group homes, day treatment centers or drug and alcohol treatment rehabilitation centers. Block 8 is for providing information on any children of the service member that have any specific education-connected issues. Block 9 requires information on any dependent children receiving Special Education at school. 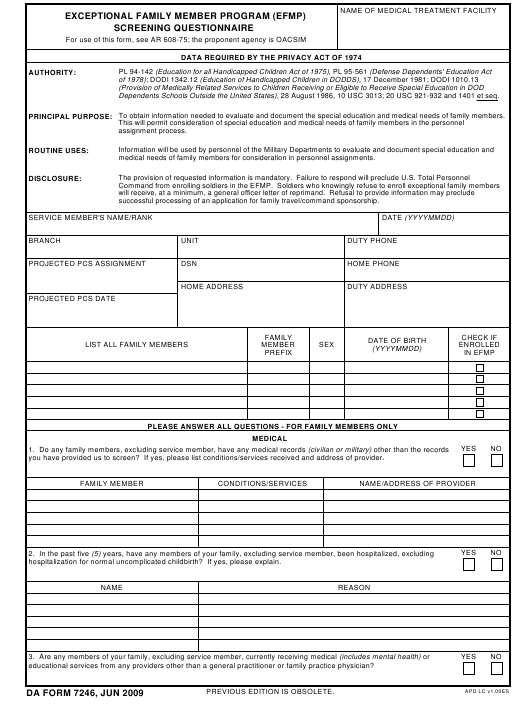 The printed name of the service member - or "military sponsor" - or their spouse along with their signatures and the date of signing the form must be provided in the appropriate boxes on the second page of the DA 7246.